In 1953, a Baltimore based group led by Carroll Rosenbloom won the rights to a new Baltimore National Football League franchise. Rosenbloom was awarded the remains of the Dallas Texans. The Colts were the first NFL team to have cheerleaders and a marching band. 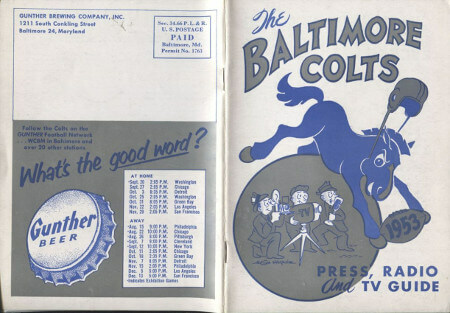 The Colts were named after Baltimore’s annual Preakness Stakes which is why many fans are bitter that Indianapolis retained the Colt team name.